Ulawun volcano is basaltic-to-andesitic Ulawun in composition and composed of lava flows interbedded with tephra layers. The upper 1000 m of Ulawun volcano are unvegetated. A prominent E-W-trending escarpment on the south may be the result of large-scale slumping. Satellitic cones occupy the NW and eastern flanks. A steep-walled valley cuts the NW side of Ulawun volcano, and a flank lava-flow complex lies to the south of this valley. 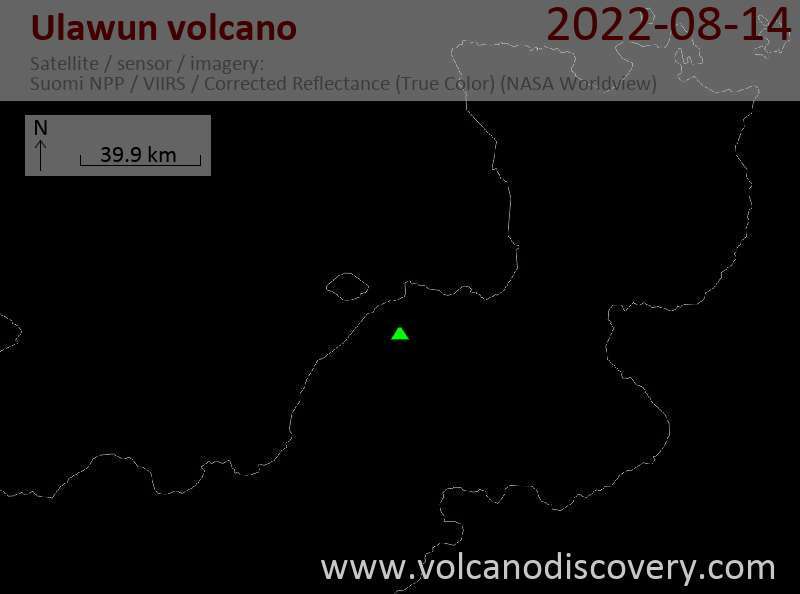 Slope failure: Ulawun volcano, along with its neighbor Bamus, is 400 m higher than most of the volcanoes in the Bismarck. This could indicate that the edifice is at the limit of structural stability. Consequently, massive slope failure is a major hazard at Ulawun volcano, which could threaten hundreds of square km of surrounding land. Pyroclastic flows: lava dome growth and large explosive eruptions often produced devastating pyroclastic flows at Ulawun, reaching many km from the summit of the volcano causing substantial damage. Ash fall: the larger eruptions from Ulawun can cause significant ash fall in surrounding areas as well threaten air traffic routes. 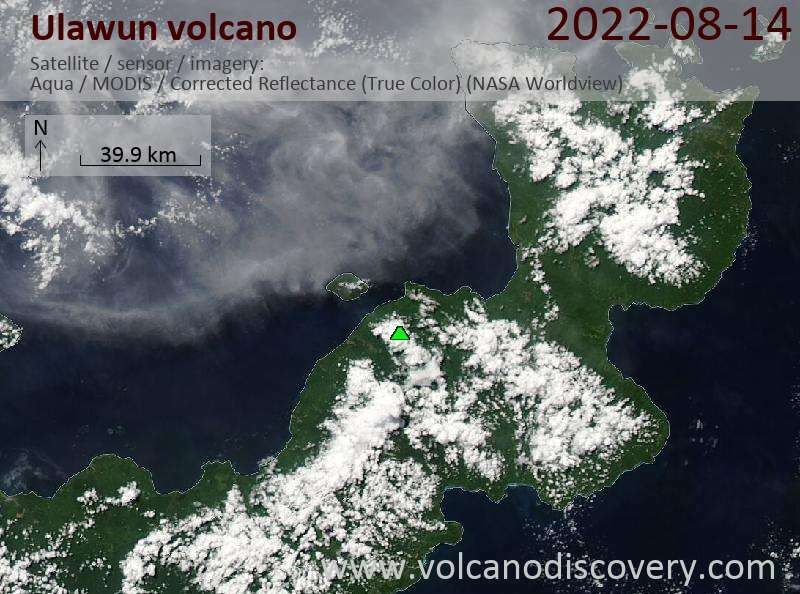 On 14-15 February 2010, ash eruptions from Ulawun volcano reached a height of 3.7 km and drifted 95 km. A magnitude 5.1 earthquake hit 10 km west of Ulawun volcano on 28 May 2009. In 2006 and 2007, frequent, near-continuous ash eruptions produced plumes up to 4.6 km high, drifting mostly into (north-)westerly directions. The tallest plume of the reporting interval (22 March 2006 - 18 Jan 2007) rose to 4.6 km altitude. Frequent ash and steam plumes produced by small eruptions were reported during March-August 2005. Intermittent ash eruptions produced small ash plumes reaching up to 3-4 km altitude durinng most of 2001-2003. An aircraft reported a large ash plume reaching 9 km, indicating a larger explosion had happened. Satellite measurements revealed that the eruption had stopped by 30 April. The ash plume may have reached a maximum of 40,000 ft (ca. 14 km). One of the largest historical eruptions occurred between 28 September - 2 October 2000. After a rappid build-up in seismic activity, a small eruption started on 28 Sep, increasing to strombolian activity at 01h20 on 29 Sep. Later that day, the eruption escalated into a vulcanian or sub-Plinian type explosion, producing an ash column reaching 12-15 km height. The peak phase of the eruption lasted less than 1 day and by 30 Sep, the eruption had already waned almost completely. It produced 3 pyroclastic flows, which traveled down pre-existing gullies on the N, NW, and SE flanks, along the same paths as flows during previous eruptions. The N-directed pyroclastic flow was the biggest and descended to 580 m elevation. There were no lava flows. The eruption caused the evacuation of nearby towns, caused significant damage, but there were no fatalities. The first week explosions after 6.5 years of quiet were seen in mid October 1999. Strong vapor emissions and a steady weak red glow from the summit were observed in June 1994. Most of 1992-1994 was characterized by infrequent small explosions. A faint glow was often visible at the summit lava dome. A dense eruption column of dark ash was erupted 1,000 m above summit on 12 January. A moderate eruption in early January 1989 ejects ash to 2 km. In the next months, occasional smaller eruptions occur, and the volcano enters a calm phase. A brief, spectacular Strombolian eruption took place 17-22 November, developing rapidly after about five days of precursory seismicity. The height of the strombolian ejections reached 200 m above the crater and a lava flow started to descend the N slope in the early evening of the 18 Nov. This flow originated from a fissure about 70 m below the summit crater and reached the lower slopes at 5.5 km distance, where its advance was coming to a halt. Spectacular lava fountains were observed during the niight of the 18th Nov.
A low-intensity Strombolian eruption occurred between late December 1984 and terminated on or around 27 January 1985. Mild explosive activity dominated 1983. A large eruption occurred between 9-14 May. It produced lava flow, ash fall and nuée ardente. It was a flank eruption which may have contributed to structural instability. An eruption during 4-19 October produced lava flows and ejecta from five vents. A large eruption deposited 10 cm of ash at Toriu, 50 km northeast of the volcano.